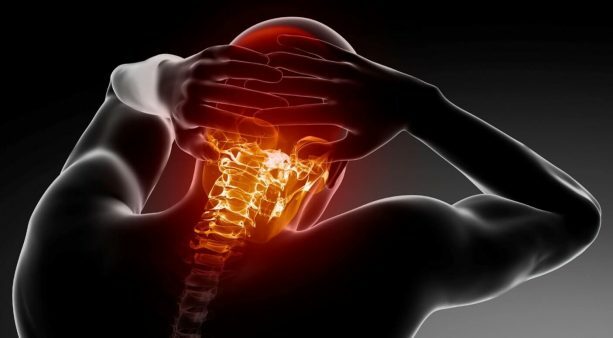 If you are dealing with neck pain and shoulder pain, you are not alone, as we see a lot people in our chiropractic centers with these problems. We have had great success in helping people feel better in this area by correcting the most common cause of this challenge— cervical spine misalignments and the resultant muscle tension. We understand how frustrating it can be dealing with neck pain and shoulder pain. 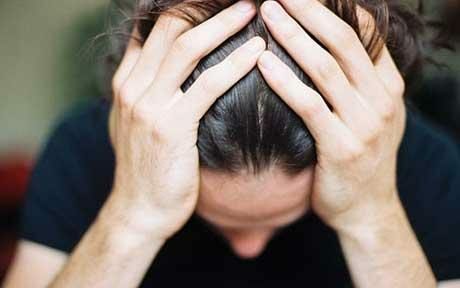 Often people feel tired, irritable and frustrated when the pain strikes. They may feel less motivated at work and as a result their productivity is limited—they get less done throughout the day. They may have less patience with their family, feel like they are on the brink of lashing out in anger at times and often just want to be left alone. Suffering through pain can have a dramatic effect on your life. The alignment of the spine in your neck area is one of the leading indicators of how your neck and shoulders feel. Let’s unpack this important concept. As seen from the side, your neck area (cervical spine) needs to be curved. Have a look at the example on the left, the green one. When your neck has this good, curved alignment, you will often have good flexibility, proper posture, very little muscle tension, and limited pain in this area. 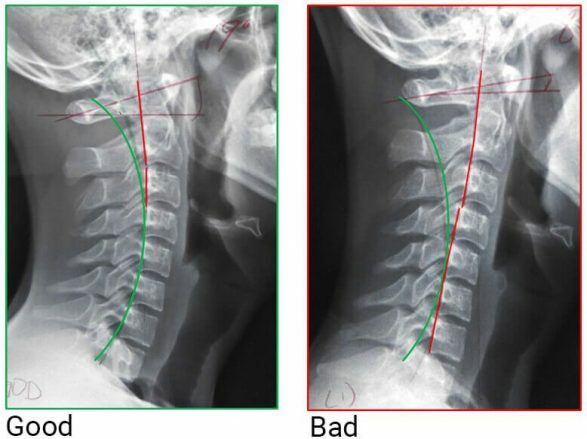 On the right (the red box) you can see a severely misaligned neck. This is known as a subluxation in the cervical spine. We are seeing a reversal misalignment and forward shift of this person’s head in this example. This significant problem will lead to irritation and stress on the nerves that are associated with this person’s neck area. Their muscles will likely become tight, stiff and inflamed. This person will have restrictions in their movement, often they will not be able bend or rotate their head to one side. They will probably find it difficult to sit up straight; they will hunch and slouch excessively. The misalignment may lead to numbness and tingling in their shoulders, arms and hands as well. They are probably battling, aches, pain and tension on daily basis. As a result of all of these challenges, they are not able to enjoy their life as much as they can. Does this sound familiar? We help people with these types of problems on a daily basis in our chiropractic centers. 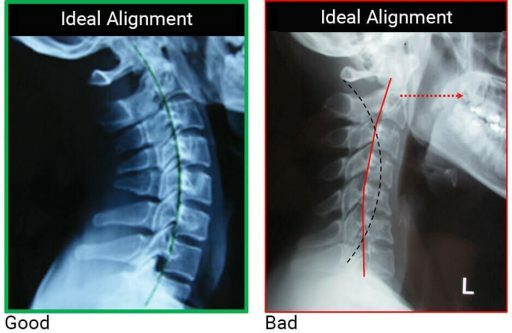 Is Your Neck Out of Alignment? If you have been reading other articles on our website, you probably know that chiropractic is much more than only a treatment for pain. Spine problems can have far reaching effects on your health, beyond aches and pains. Your spine protects your nervous system and when your spine is out of alignment, your misaligned spinal bones will stress and possibly damage your nervous system. This can have significant consequences for your health. Your nervous system controls all aspects of your health and life. Spine problems damage your nervous system and weaken your health from the inside-out. For example, the nerves of your cervical spine (neck) region control your heart, lungs, digestive organs, hormonal balance, immune system, ability to cope with stress and many other vital functions of your body. Cervical spine subluxations can weaken your health in this vast variety of areas. Even if you are not experiencing pain, you can definitely benefit from a spinal checkup. Neck and shoulder pain are present at near epidemic levels in Singapore. They are among the most common problems we see. How many of the above factors are present in your life? So if you are dealing with pain, what should you do? The first step is to always have your spine checked to understand what is causing your pain and to see if chiropractic is the right approach for you. If you do have a physical misalignment (subluxations) in your spine that is causing pain of some kind, then you can definitely benefit from chiropractic adjustments. We have helped a lot of people with similar problems. The example on the left (the red box), shows the significant misalignment that was present when this person first came in to see us. They were experiencing neck pain, shoulder stiffness, headaches as well as bad posture and chronic tiredness. Clearly, they were facing a lot of challenges in their life. On the right (the green box) you can see the results the person saw about one-third of the way through their care. We achieved significant improvement in their alignment with a series of chiropractic adjustments, exercise, stretches, and guiding them to eliminate some of their bad habits. They also had a number of health breakthroughs as they were feeling less pain, they were sleeping better, they had more flexibility in their spine, and more energy overall. At the point of the re-x-ray, we still had a lot of improvement to look forward to as well. Healing is a journey. Misalignments in specific areas of your spine can cause different symptoms, find out the possible areas that are misaligned just by your symptoms. There is no reason to continue dealing and living with these challenges. Chiropractic has a long track-record of helping people with many types of pain and symptoms.